Rubbery front cover attracts pocket lint, dust, etc. I cannot recommend this as a viable case for the M8. The user experience is extremely poor, and not just for the cost. Overall, I found this case unusable and have already made it a former part of my life. If you aren't using it for the wow factor of the Dot View functionality, don't bother using it at all. HTC’s Dot View functionality certainly caught my eye when the phone was coming to market. I’m a sucker for the old 8-bit stuff, as I grew up playing those sorts of games on PCs and the first few generations of game consoles. This looked so good, I had to have it and ordered it with overnight shipping. The Dot View case allows you to see some important information and perform some simple actions without opening the cover. A double tap on the front displays the time and weather as pictured above, for example. Swiping down from the top allows the user to enter HTC’s Voice Control app. Finally, if a phone call is received a swipe up or down will answer or dismiss the call. From a design standpoint, HTC is certainly one of the most interesting companies in the game. They picked over every tiny aspect of the M8 and ensured it to be the smartphone of the year yet again. From having the device, I was certain the same level of detail would be present in their biggest accessory to the device. Boy was I mistaken. The front flap is essentially a semi-rigid piece of plastic completely covered by a very rubbery coating. This has holes all over the front that allow the Dot View to shine through the case. The back is a hard plastic which curves just like the rear of the device. On the left side near the middle of the front is a small HTC logo with no holes. The logo houses a small magnet which is what allows the phone to know when the case is affixed and closed. The back side is half of the fatal flaw of this accessory. Having the back curve along the back of the phone does make it fit nicely in your hand while the case is closed. It does not, however, allow for the front of the case to lie flat against the back. If the spine were a millimeter or so longer, this wouldn’t be an issue as one could theoretically balance the case in the middle of the rounded portion, however this is not the case. The spine is just too short to allow for this balance. Further, the rigidity of the front does not allow for the Dot View portion to “hug” the rear. To take this even further, the case always wants to be closed. While the case is open, if you release the flap while holding the phone the flap will quickly close. All of these present the biggest issue, and what was the deal-breaker for me. The phone is extremely unpleasant to use with the case open. The front rests at an angle on the back and holding it with one hand or even typing on it while holding with both hands is pretty awful. 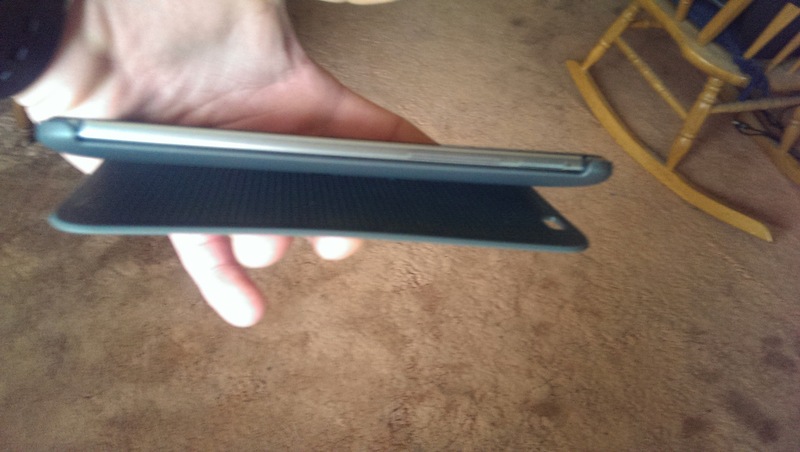 When I layed the phone on a table with the front folded behind, it resulted in a comical bouncing action due to the curved back and rigid front. As much as I wanted to like and recommend this case, I simply cannot do so. The “wow” factor of the front was completely offset by the lack of design. It seems to me nobody tested actually using the phone with the case open. For a company who’s design is top notch, there was a total lack of oversight in this accessory. I have the case, I love it, but it’s just to be a showoff and say “Can your cover do this?” And it has worked. People are amazed by the dots, and even if the cover lacks protection safety, or has design issues, people would still buy it just for the front part alone. For more protective situations, I have a Spigen SlimArmor, which is sleek and solid.